Cyrenians hope the social media messenger service will raise awareness. An Edinburgh charity has created a Facebook messenger service which allows the public to talk to a virtual homeless person. The "bot", named Alex, is based on the experiences of real homeless people and can answers questions about how he ended up living on the streets. 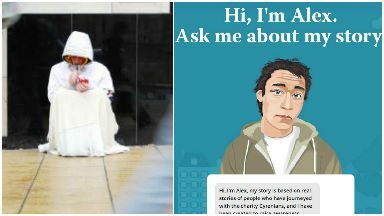 Cyrenians hope it will help to raise awareness and understanding about homelessness. The charity said it wanted to make the Alex character appear normal. He will provide different answers depending on what questions are asked. Ian Grimwade, Cyrenians' head of business development, told STV News: "We wanted to make him real, he has a personality, he has a character. "He's a young man with a sense of humour. "He's also very normal - he's not any different from any of us and this is very true of anyone who can become homeless. "It's a situation any of us might be just a few steps away from."